This article was originally published in High Country News, a magazine about the American West’s environment and communities. Read more stories like this at hcn.org. Cory has brought me here because the slump provides such a vivid example of the ordinarily inaccessible stuff she studies. Slick with meltwater, the chocolaty goop brims with microscopic bits of once-living things that have not touched sunlight or air or flowing water for centuries, perhaps millennia. Deeper still lie plant and animal remains that could be tens of thousands of years old, dating back to the Pleistocene, when steppe bison and wooly mammoths wandered a treeless region that extended from here across the Bering Land Bridge, all the way to Siberia. For a moment we just stand there, staring down at the raw gash. Occasionally, Cory lifts her head to scan the shoreline for furry visitors. Despite our proximity to the field station, we are in a wild place, without roads or trails or protective shelter. For years, in fact, the lake was known to researchers only by a number. It earned its moniker in 2013, when a hardy trio of young researchers hauled their instruments nearly eight kilometers cross-country to measure the just-discovered slump and spotted a wolverine circling a wounded caribou. Cradled by cloudberry, dwarf birch, and willow, Wolverine Lake crouches in the shadow of the snow-streaked Brooks Range. A bit over half a kilometer across, it formed during the retreat of a giant lobe of ice that, 60,000 years ago, advanced from its stronghold in those looming mountains to fill the valley of the Sagavanirktok River—commonly called “the Sag”—into which the lake’s outlet stream now drains. The irregular shoreline still traces out the shape of the marooned ice fragment that molded the bowl-like basin. The buried ice that triggered the slump is yet another relict of this long-vanished world, as are the glacier-ground rock and organic debris now streaming into the water. To those like Cory who know how to parse it, this slump is a source of wonder. It offers a tantalizing portal into the hidden world of permafrost, the broad band of perpetually frozen soils that undergirds a circumpolar region more than twice the size of the continental United States. This region is now warming at twice the rate of the global average, with grave implications for the stability of permafrost and all it holds. Both small and large things are poised to emerge from this gelid domain, from common soil-dwelling bacteria, to the nearly intact carcasses of Ice Age megafauna. The most important, however, is the carbon stored in the frozen layers of leaves, stems, and roots that lie beneath our feet. “Think of a cup of tea,” Cory suggests. The carbon-rich organic materials the slump is carrying into the lake are too small to be removed with a filter, but substantial enough to impart a tinge of color and even flavor. The water samples collected from the lakes, streams, and rivers here indicate that the brew percolating out of freshly exposed permafrost differs sharply from the steep that comes from shallow layers of soil that thaw and refreeze in accordance with the natural cycle of seasons. At first, this might seem little more than a bit of esoterica to tuck away for a trivia exchange in the Toolik dining hall. 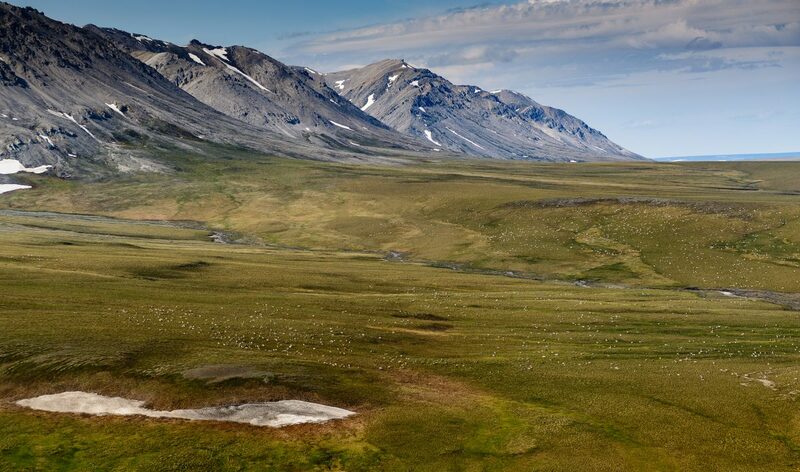 Yet discerning permafrost’s protean signature is one of the keys to understanding what this vast landscape’s transformation might mean—not just for the Arctic, but for the whole planet. The research Cory conducts on a meticulous, molecular scale is just part of a larger body of work aimed at answering an increasingly critical question. Globally, the frigid soils of the Far North store almost double the amount of carbon already circulating in the atmosphere in the form of heat-trapping carbon dioxide—enough to drive the climate system into territory Earth has not experienced for millions of years. But carbon travels an invisible highway with multiple on- and off-ramps, some of which lead into the atmosphere, some away from it. Figuring this out entails an excruciatingly complicated set of calculations. In order to plug in the numbers, scientists like Cory must first understand the biological and chemical processes that control the routes carbon takes through soils and surface waters. As the preserved past thaws and begins to decay, Cory wonders, just how much of that carbon will end up in the atmosphere? And how fast? To peek at permafrost from below, I toured the “permafrost tunnel” bored into a hillside outside Fairbanks, Alaska, by the Cold Regions Research and Engineering Laboratory of the US Army Corps of Engineers. Kept at a chilly -4 °C, it exudes a smell reminiscent of garden dirt. There, embedded in a matrix of frozen silt, I could see the bones of mammoths, the horns of bison, and the roots and leaves of sedges that grew here more than 30,000 years ago. I could also see rocks and gravels and dark wedges of ice glistening in the artificial light. This hard, heterogeneous composite has long been a barrier to economic development in both the Arctic and sub-Arctic. The gold miners who flocked to the Alaskan and Canadian Yukon hoping to make their fortune around the turn of the 20th century had to use wood fires, hot water, and steam to thaw the gold-bearing gravels. “As resistant to excavation as a mass of reinforced concrete,” the general manager of one mining company complained, though the difficulty didn’t stop it from buying up and working a number of placer claims. Yet as the slump at Wolverine Lake illustrates, permafrost has a geophysical Achilles’ heel. Once subsurface temperatures creep above freezing, the ice it contains melts and flows away. In the uplands, as around Wolverine Lake, this ice is often a glacial legacy. Elsewhere it comes from rain and snowmelt that have gradually worked their way down through a network of surface cracks and refrozen. Some sections of permafrost contain the merest flecks of ice, barely enough to moisten thawing soils; others are larded with massive wedges that can measure three or more meters across. Until recently, worries about the stability of permafrost focused on the more southerly boreal zone. 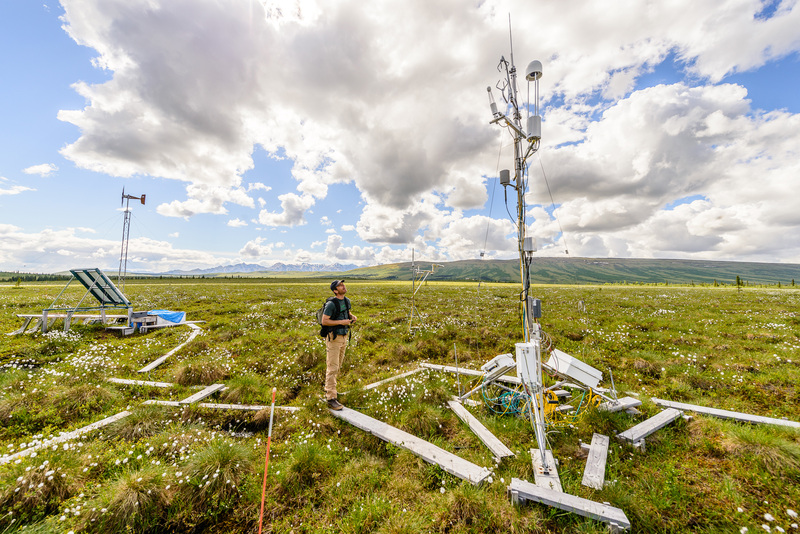 But geophysicist Vladimir Romanovsky, head of the Permafrost Laboratory at the University of Alaska Fairbanks Geophysical Institute, has grown increasingly concerned about the permafrost on Alaska’s cold North Slope. For four decades now, the lab has tracked permafrost temperatures in a network of deep holes field crews have drilled across the region. Beginning in 1988, Romanovsky notes, temperatures in the northernmost holes started to rise, echoing the rise in air temperatures. Readings taken near Prudhoe Bay show that the permafrost there has now warmed by more than -15 °C at a depth of 20 meters and by -13 °C at a depth of one meter, where temperatures now range from about -7 to -2 °C. If the trend continues, Romanovsky says, the permafrost close to the surface could reach the thawing point by 2050. Thaw slumps can occur in colder times—von Kotzebue’s voyage took place towards the end of the centuries-long cold snap known as the Little Ice Age—but they are more likely to occur in balmy interludes. In 2005, a thaw-triggered landslide near Toolik hit another lake known to scientists only as N14. It charged the water with so much glacier-ground rock that the color “went from clear to milky blue,” recalls Feng Sheng Hu, a paleoecologist at the University of Illinois at Urbana-Champaign. 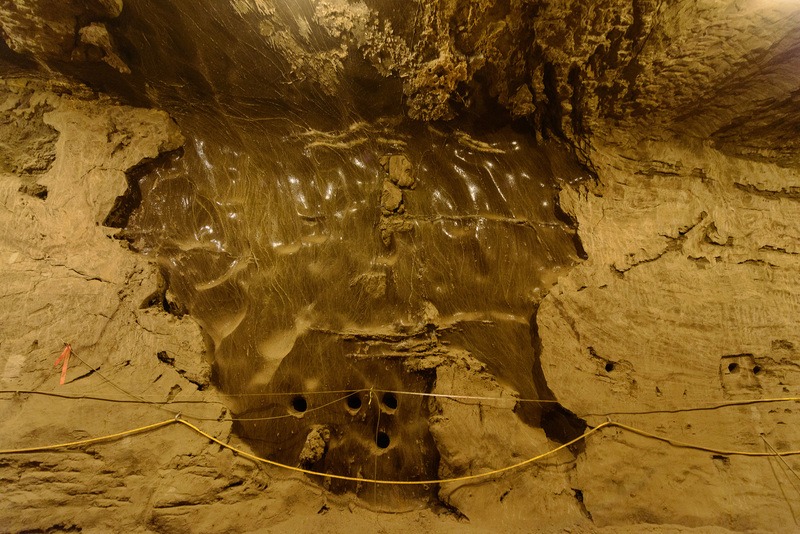 The same rock flour showed up as distinct deposits in two meters of cored sediments Hu and his colleagues obtained from the deepest part of the lake. The sediments yielded a thermokarst record that covers the past 6,000 years. Of 10 large slumps that occurred over that time span, seven coincided with climatic intervals marked by warmer summers. Thermokarst events are “the high-speed trains of permafrost thaw,” observes Cory’s colleague, University of Michigan ecologist George Kling, and there are suggestions they may be increasing. 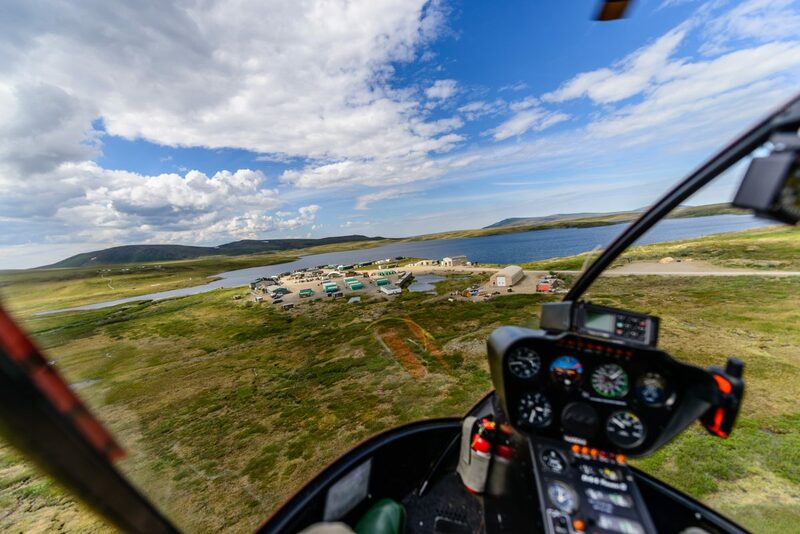 In 2008, an aerial census around Toolik counted nearly three dozen within a 600-square-kilometer area. Two-thirds did not exist prior to 1980. How many of these might have occurred without the profligate burning of fossil fuels is hard to gauge, but in the future, according to an international team of scientists, an estimated 20 percent of the area underlain by permafrost may become vulnerable to thaw-driven collapse as gears in the climate system continue to shift, ratcheting Arctic temperatures ever higher. For a sense of how permafrost shapes Alaska’s northern reaches, you might drive to Toolik from Fairbanks, heading out on the Elliott Highway to Livengood, then turning north onto the Dalton Highway. This is the legendary Haul Road, the rough two-lane trucking corridor that parallels the flow of crude oil from the North Slope through the Trans-Alaska Pipeline to the tanker terminal at Port Valdez. The route rollercoasters through some of the state’s most scenic country. It is treacherous, with steep curves, virtually no guardrails, and, in places, a slalom course of thaw-triggered potholes. For the first part of the journey, the Haul Road slices through the boreal forest of the cold, dry Alaskan interior. Here the permafrost is disconnected, creating a subtle mosaic in the form of alternating stands of black and white spruce. White spruce mark the warmer, better-drained slopes that are often permafrost free, while black spruce—funny little trees that look like dark green bottle brushes—sink their roots into the cold, soggy soils above an impermeable layer of frozen ground. After you cross the Arctic Circle and head into the Brooks Range, the trees become sparser and scragglier, then disappear. Beneath the tundra of the North Slope, permafrost forms a continuous underlayment, extending from the Brooks Range to the edge of the Arctic Ocean. At Toolik, this icy substrate is 180 meters thick from top to bottom, compared to 45 meters in the boreal zone. Farther north, beneath the Arctic Coastal Plain, it extends to depths of 600 meters. Throughout this vast realm of frozen soil, thermokarst serves as a source of ecological disturbance and renewal. On steep terrain it causes landslides, bulldozing new clearings and replenishing the nutrients in waterways. (Along with carbon, permafrost also contains nitrogen, phosphorus, and calcium.) On the flat, it creates depressions that evolve into ponds, lakes, and wetlands. In the boreal zone, along the Tanana River, successive episodes of thermokarst are now converting a birch forest into bogland. Thermokarst is impacting the built landscape as well. In Alaska, one of the most serious impacts of climate change will be the billions of dollars in damage, already extensive, that thermal erosion deals to infrastructure. But until warmth awakens it, permafrost remains inert. The biological and chemical action takes place in the layer of seasonally thawed soil above it, the “active layer,” as it’s called. This is where the root zone is, where microorganisms live, where rain and snowmelt circulate, blocked from following pathways that would lead to deeper drainage. Along with the chilly air, which stymies evaporation, the impermeability of permafrost is the reason the Far North can be so dry—Prudhoe Bay gets less precipitation than Phoenix, Arizona—and yet so waterlogged. A stunning example can be glimpsed from a bush plane flying northwest of Toolik, along the coastal plain. Everywhere, it seems, water puddles on the surface in geometric arrays. It twists and turns in sinuous ribbons. It collects in lakes that look like daubs of sky brushed across the tundra. 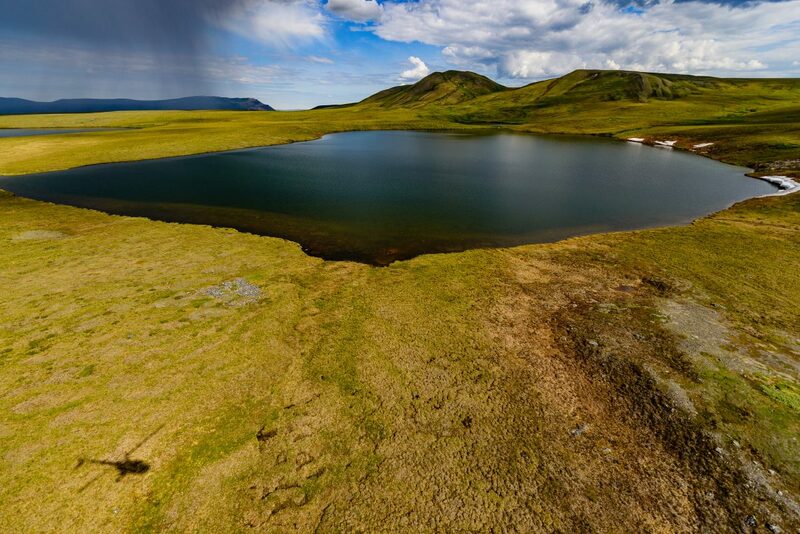 These are the famous “thaw lakes,” scooped out of the permafrost by thermokarst. Many are too shallow to sustain fish, but nonetheless help support hundreds of thousands of migratory waterfowl and shorebirds, including Brant geese, king eiders, and buff-breasted sandpipers. The aquatic environments of the Arctic are not just ecologically important; they are climatologically significant as well. Over 40 percent of the carbon dioxide currently entering the atmosphere from the Arctic comes from its surface waters. The reason is simple: in addition to the carbon-rich detritus thrown off by algae and other aquatic organisms, Arctic lakes, rivers, and streams also receive generous infusions of soil carbon that seeps into their waters from the active layer above the permafrost. As permafrost thaws, its carbon will also enter the hydrologic system, becoming an increasingly important part of the emissions stream. But a carbon molecule drifting through water doesn’t magically throw off carbon dioxide (or methane, a less common but even more potent greenhouse gas). First it must be broken down, most often by microbes that remain metabolically active year-round. One of the curiosities around Toolik is the sudden release of CO2 that occurs each spring when the ice covering its lakes breaks up. This short-lived event is a bit like uncapping a soda bottle, without the audible fizz. It’s due to the fact that, under the ice, microbes have been busy consuming carbon-rich molecules, exhaling carbon dioxide as a byproduct. The addition of permafrost carbon to soils and surface waters adds a new layer of complexity. Not long ago, much of this carbon—dissolved organic carbon or “dead old carbon,” as Rose Cory calls it—was thought to be structurally so complex that it would take a long time for microbes to process it. 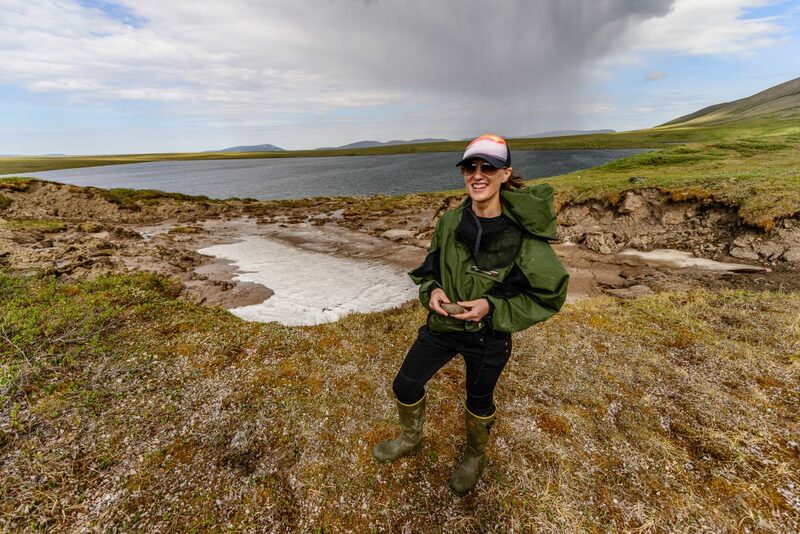 Instead, Cory and her colleagues are finding, these tiny organisms lustily respond to fresh infusions of permafrost carbon, attacking tasty morsels with enzymes like nanoscale ninjas hurling dagger-sharp stars. The Toolik Field Station, a compact jumble of prefab structures, straddles a site that once housed construction crews for the Trans-Alaska Pipeline. Operated by the University of Alaska Fairbanks and funded by the National Science Foundation, along with other government agencies, it has become a magnet for scientists involved in Arctic research. To avoid perturbing the permafrost, many of the buildings here are elevated above ground, as are long sections of the pipeline. Climbing the steep staircase to Cory’s trailer lab, I find her huddled with her graduate students in front of a computer. She says it feels a bit serendipitous to find herself in a double-wide again. The shape and feel of the workspace evoke warm memories of the trailer in rural Montana that was her childhood home. “ I loved it,” she says. “You know the old expression, ‘You can take the girl out of the trailer, but. …’ ” Everyone has just arrived, so the lab is a study in controlled clutter. This is where the team will spend hours doing tedious and painstaking analysis. Still unpacked are boxes of plastic bottles, which, over the summer, will be filled in the field with samples of water aswirl with carbon and brought here for study. This sunlight treatment, the scientists found, substantially boosted the microbes’ ability to convert the dissolved carbon compounds in the samples into carbon dioxide. The mechanism? Light, ultraviolet light in particular, is a breaker of chemical bonds. Like a kitchen knife, it slices and dices organic molecules into smaller, more palatable bits. A second series of experiments focused on the microbial communities cultured from Arctic soils. 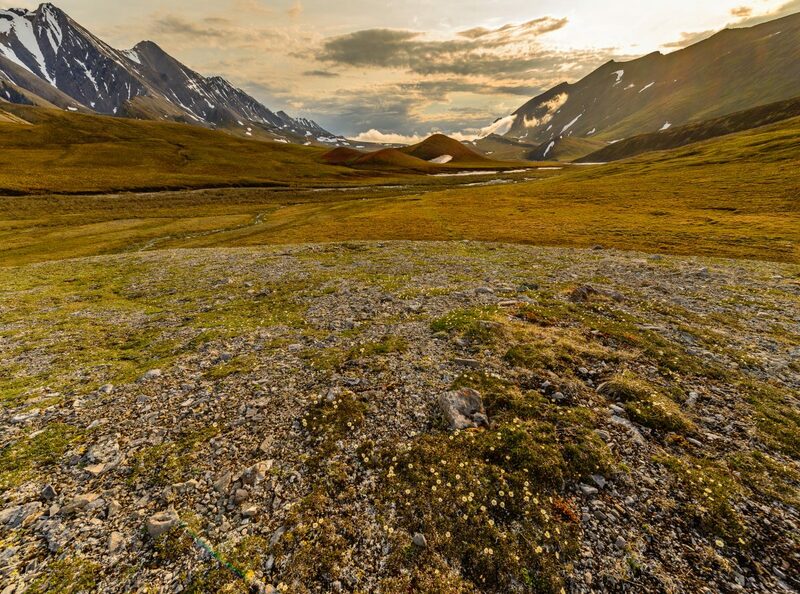 Most effective at decomposing light-treated organic carbon were those that emerged from thawed chunks of permafrost where they’d remained dormant, or even—as some believe—sluggishly active for centuries. But microbes are just part of the story. In a study of more than 70 lakes, streams, and rivers, including the Sag, Cory and her colleagues have established that exposure to sunlight alone can turn carbon into CO2, without any microbial involvement. The rate at which this happens varies with the cloudiness of the sky, the thickness of the ice cover, and the depth and clarity of the water. But on average, they found, this abiotic conversion may account for about a third of all the carbon dioxide currently released by Arctic surface waters. It’s a photochemical pathway that will increase in importance as rising temperatures accelerate the thawing of permafrost and the melting of sunlight-occluding ice. Leaving Cory’s lab, I head out on the network of boardwalks that lead from the field station to study sites scattered across kilometers of tundra. In one way or another, most of the scientists who work here are involved in tracking the changes rippling through this region. On either side of the boardwalk, fields of cotton grass prepare to carpet the landscape with silvery seed heads. What will this high-latitude ecosystem look like a century from now? Will cotton grass, Toolik’s signature plant, still grow here in such profusion? The last time our planet confronted such a consequential upheaval was around 12,000 years ago, when the last ice age ended in a rolling thunder of warmth. On a geological timescale, the changes that followed were fast—sea levels rose, weather patterns changed, species migrated poleward—but measured against the lifetime of an itinerant hunter-gatherer, they would have been all but imperceptible. This time around, the rate of transformation and its impacts on our densely settled planet are becoming obvious within a generation, especially in the Far North, where air temperatures have been rising at a clip of 0.5 °C per decade. The natural world is now responding in ways that amplify that warming. Dwindling sea ice is changing the color of the Arctic Ocean, uncovering dark blue waters, which absorb solar heat rather than reflect it. The loss of ice is likewise exposing the permafrost-rich coastline, and the remote communities along it, to storms and frenzied waves. In the boreal zone, wildfires stimulated by record heat and drought have burned through millions of hectares of trees and released the carbon once locked into wood; they have also turned thick layers of forest duff to ash, ripping away the summer insulation that once protected the permafrost. The good news, says Northern Arizona University ecologist Ted Schuur, lead investigator for the Permafrost Carbon Network, is that a sudden, catastrophic release of CO2 from permafrost seems unlikely. The bad news is that a steady, incremental leak is plenty problematic on its own. Under the current warming trajectory, Schuur and his colleagues estimate, between five and 15 percent of the carbon stored in the Far North’s soils is likely to make it into the atmosphere by the start of the 22nd century. This might not sound like much, but 15 percent is equal to the jump in atmospheric CO2—from 280 to more than 400 parts per million (ppm)—that has occurred since the Industrial Revolution. To avoid courting danger, any additional rise in global mean temperature would wisely be kept below 1 °C, according to the Intergovernmental Panel on Climate Change (IPCC). That, in turn, means stabilizing carbon dioxide levels at 450 ppm, leaving little time to dawdle. This is why permafrost carbon is such a wild card. Even a modest release will complicate efforts to step back from the brink. As I head back down the Haul Road, the questions that arose at Wolverine Lake seem more pressing than ever. Out the side window, I watch the pipeline track along its 1,287-kilometer journey. Late last year, in an attempt to keep the pipeline at full capacity, Alaskan Republican Senators Lisa Murkowski and Dan Sullivan tacked onto the federal tax bill a provision that opens an ecological gem along the coast—the Arctic National Wildlife Refuge—to oil and natural gas exploitation. Signed into law by President Donald Trump, the bill revives a long-simmering controversy that pits economic interests against potentially enormous environmental costs. Were it not for the pipeline, and the occasional 18-wheeler lumbering by, I would feel as though I were traveling through an exquisitely rendered scroll painting, marveling at timeless vistas of craggy peaks, rolling hills, and jewel-like lakes. The sweep of the terrain invites a sense of permanence, as if things have always been this way, as if they will continue to be this way forever. And, yet, beneath the surface, a geophysical dragon is stirring. 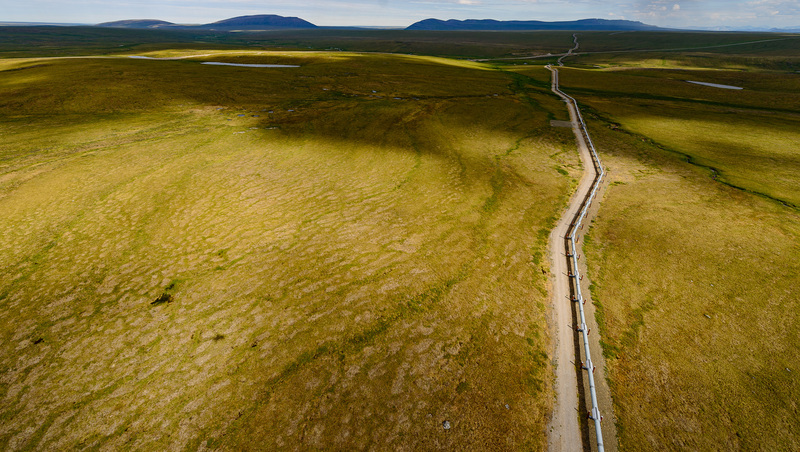 A penumbra of clouds gathers above the pipeline, casting it into shadow. J. Madeleine Nash is a San Francisco-based science writer who frequently covers climate issues. A former senior correspondent at Time Magazine, she is working on a book about climate change with her physicist-photographer husband, Thomas Nash/Nashpix.com. Cite this Article: “The Impermanence of Permafrost,” Hakai Magazine, Mar 27, 2018, accessed April 25th, 2019, https://www.hakaimagazine.com/features/impermanence-permafrost/. Melting ice wedges can make the ground drop out, driving land subsidence in the warming Arctic.